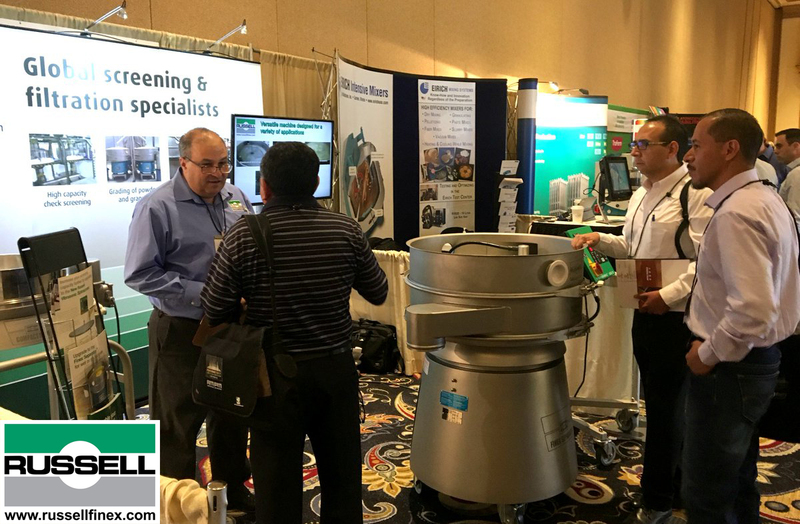 Russell Finex was pleased to attend POWDERMET2017, an international conference on powder metallurgy and particulate materials. Presented by the Metal Powder Industries Federation (MPIF) and APMI International, in conjunction with the Additive Manufacturing with Powder Metallurgy International (AMPM) at the Bellagio hotel in Las Vegas, the annual conference welcomed more than 200 global experts with special events including guest speakers, breakout sessions and trade exhibitions. Russell Finex was among the 100+ exhibitors on hand to showcase specialized equipment for metal powder production and processing. Among its offerings were the innovative Russell Compact Sieve®, designed with a smaller footprint in mind, this metal powder vibrating screener removes oversize contamination without sacrificing headroom. Also on display, was the Finex Separator™, an industrial round separator which grades metal powders for precise particle sizes. The Russell Finex booth also included the revolutionary Vibrasonic® Deblinding System, an ultrasonic deblinding system ideal for difficult to screen materials, such as light or heavy density metal powders. The system prevents mesh screen blinding and significantly improves throughput rates. To find your customized solution to metal powder processing, contact us about your exact requirements or visit the video library to see the diverse range of products in action.